I’ve been having something of a love affair with this succulent this year, and the combination of the dark blue-purple rosette combined with its orangey-red flowers makes it the perfect choice for Halloween. Pachyverias are hybrids of Pachyphytums and Echeverias. While trying to research the parentage of this particular cultivar, I really struggled. There was talk on the International Crassulaceae Network of this cultivar acually being a cross between Echeveria affinis and Sedum craigii. Indeed the flowers of Sedum craigii are strikingly similar to those of Pachyveria ‘Blue Mist’. Who knows, perhaps in time this cultivar will be renamed Sedeveria ‘Blue Mist’. For now though, we’ll just call it a Pachyveria. If you happen to know the parentage, I would be eager to hear. Feel free to contact me on facebook or Instagram. 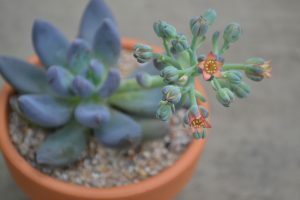 Distinctive features: Dark blue/grey/purple torpedo shaped leaves, a slightly looser rosette compared to Echeveria, very cute, pretty orangey-red star shaped flowers. Why I love it: I am always a fan of orange and purple colour combinations, but for me the real draw of this succulent is the unique colour of its foliage. So many Echeveria and Pachyphytums are grey or blue. 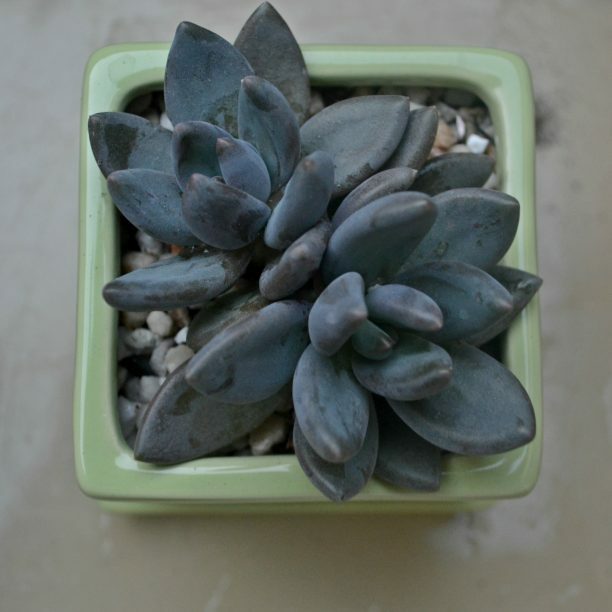 Pachyveria ‘Blue Mist’ is the wild child – darker, rebellious and a stand out from the crowd succulent. It looks awesome planted among green and teal coloured succulents for some depth and contrast. 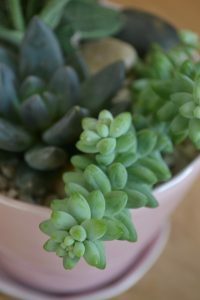 Things to watch out for: Both Pachyphytums and Echeverias are native to Mexico, so they have similar cultivation requirements – like plenty of sunlight and a dry soil in winter, and their hybrids are no exception. 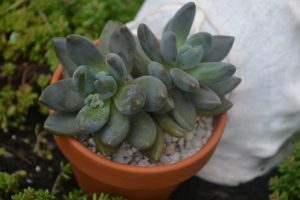 I have found this Pachyveria starts to turn more of a grey-brown in prolonged strong sunlight, so during the summer, I would think about giving this plant bright morning sun and some afternoon shade. Take care not to get water caught in the leaves too. 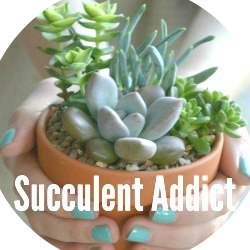 What’s your opinion of this dark and mysterious succulent? If its a favourite of yours, please do give it a shout out below. Have a good week!